Celebrating Carnival Time – Avsenik Style! This year, Carnival Saturday (Pustna sobota) also happened to fall on Valentine’s Day and Radovljica’s Carnival Dance (Pustni ples) took place at the Krek Hotel and Restaurant in Lesce. It is traditional to dress up in masks and costumes for pust, and the theme of this year’s dance was the music of the famous Avsenik Ensemble, from the nearby village of Begunje na Gorenjskem, since this year marks the 60th year since the issue of the hugely popular track ‘Na Golici’, which is also one of the most widely played. Since Avsenik have produced more than 1000 songs, attendees had a wide range of songs and lyrics to allow them to get creative with their costumes. 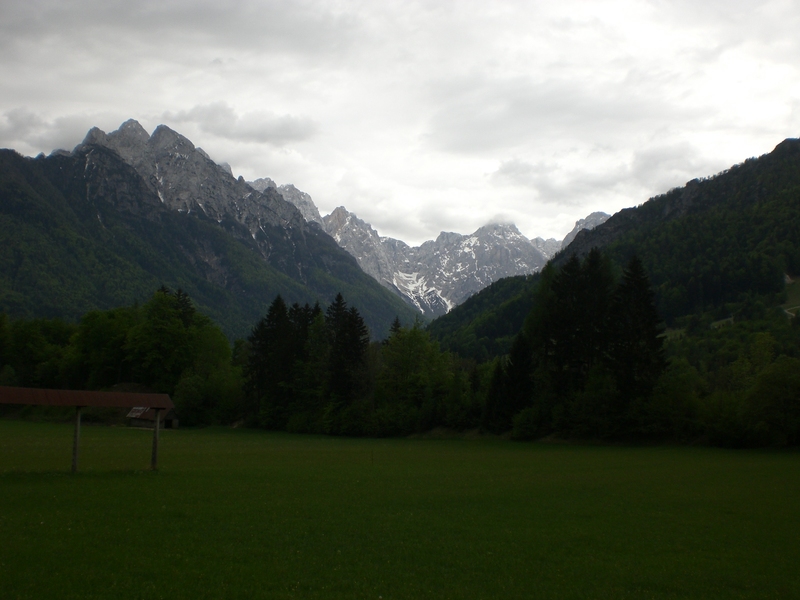 Perhaps some of the best known songs, in this area at least, are ‘Na Robleku’ and ‘Na Golici‘ – named after two peaks in the Karavanke mountains which are popular destinations with hikers. The music of the Avsenik Brothers is actually a world-wide phenomenon; it is particularly popular in Slovenia and neighbouring European countries, but is also known in the USA and even further afield, and their music has won countless awards. 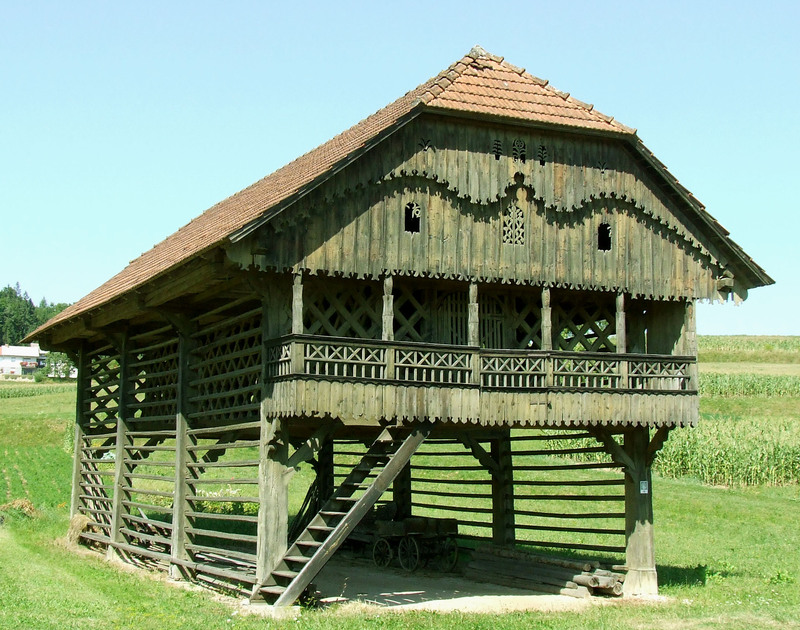 The home of Slovene popular folk music is at the birthplace of its founders, Slavko and Vilko Avsenik, at Pr’Jožovcu in Begunje. 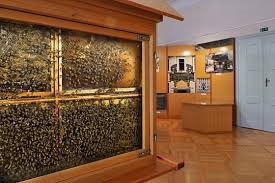 It is regularly visited by coach loads of fans of their music and the restaurant hosts regular music performances by the Avsenik House Ensemble, as well as workshops, festivals, competitions and other events. 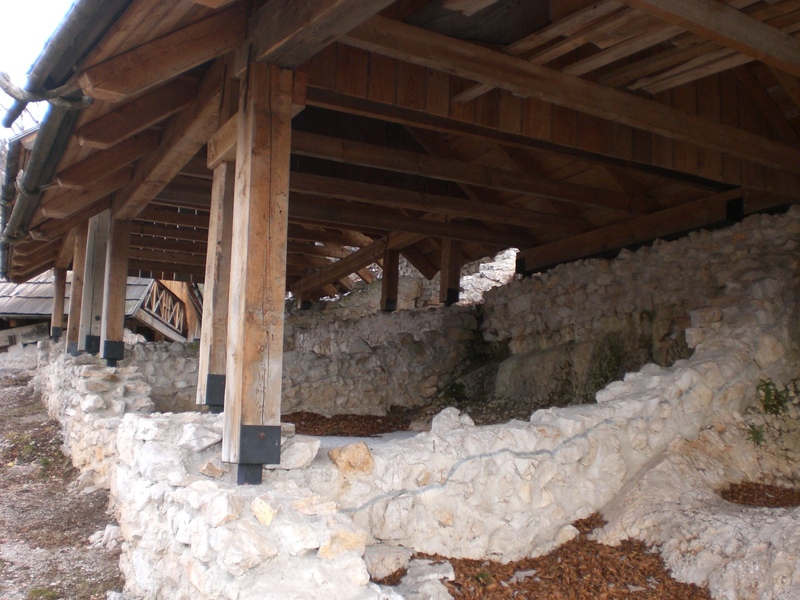 There is also a gallery and museum, music school, and guest accommodation. If you are visiting the Radol’ca area, then a visit isn’t complete without popping in to see, listen to, or even dance to, a bit of Avsenik! 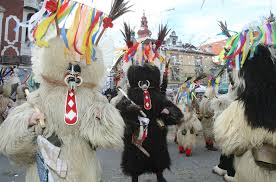 The main day of pust is pustni torek (Shrove Tuesday) when, wherever you are in Slovenia you could be forgiven for thinking it is Halloween as children go to school dressed up as all kinds of ghosts and gouls, and some can be seen going from door-to-door trick-or-treating. However, there is actually a point to pust; to help drive winter away by scaring it with various costumes and masks. So, despite not being one inclined to fancy dress, masks etc., I am more than happy to join in and help drive winter away! 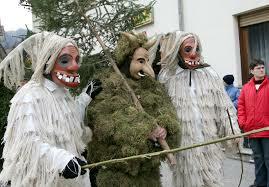 All the different regions of Slovenia have their own pust traditions, customs and characters. 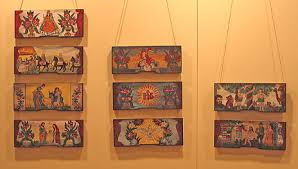 Among the most known are the ‘kurenti‘ from Ptuj (seen below left), where the country’s largest carnival takes place, with celebrations lasting a whole 2 weeks, and also the ‘laufarije‘ from Cerklje (below right). I think they look frightening enough to shoo-off winter! After 4 long weeks, and following an x-ray last Tuesday I was finally free of my immobilising shoulder immobilser last week and what a relief it was. To be able to quickly and easily get dressed and have a shower, do up my shoelaces etc. I, of course, wasted no time on my mission to regain my fitness and on Wednesday morning I was already up and out at 7am and at the mountain hut Roblekov dom in record time! Well, you didn’t expect any less did you?! 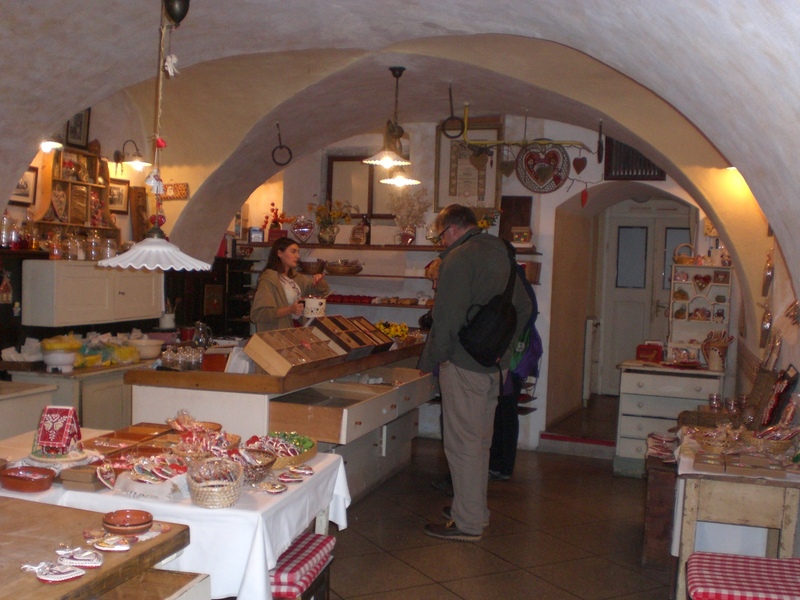 Oh and I should just add, here in Slovenia we eat doughnuts for Shrove Tuesday, instead of pancakes. I will, of course, oblige! 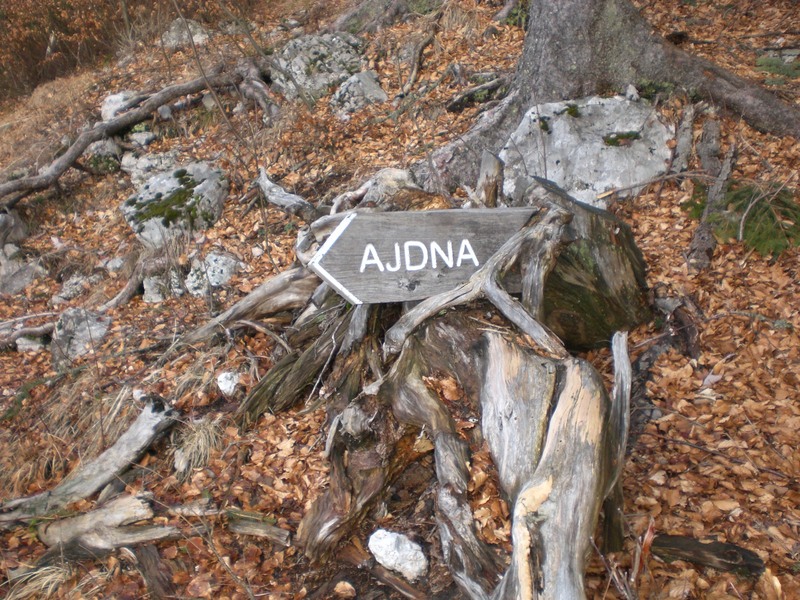 The Draga Valley lies at the far end of the village of Begunje na Gorenjskem. 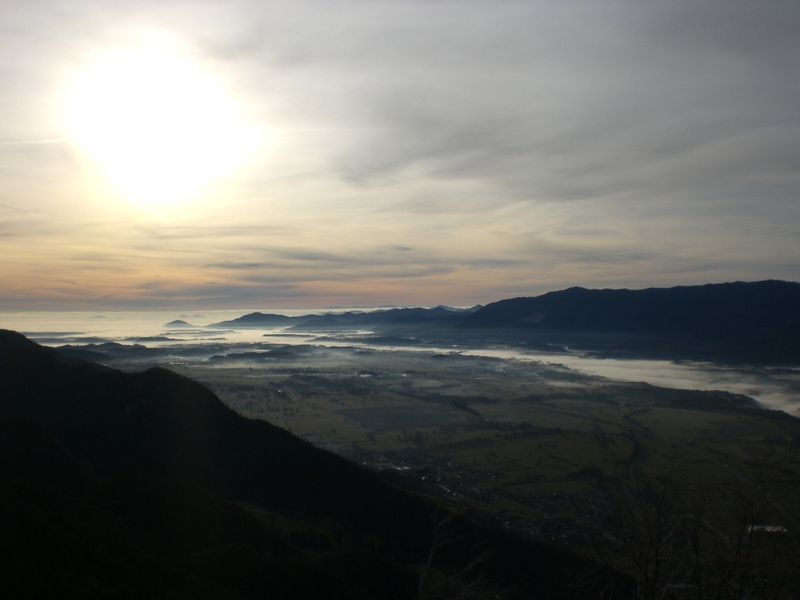 The valley is little more than a couple of kilometres in length yet is a very popular destination, particularly as it is the start point for hiking to numerous destinations in the Karavanke mountains. The road through the valley has a monument and cemetery in remembrance to hostages of the second world war who were held in the Gestapo prison in the nearby Katzenstein Mansion in Begunje. 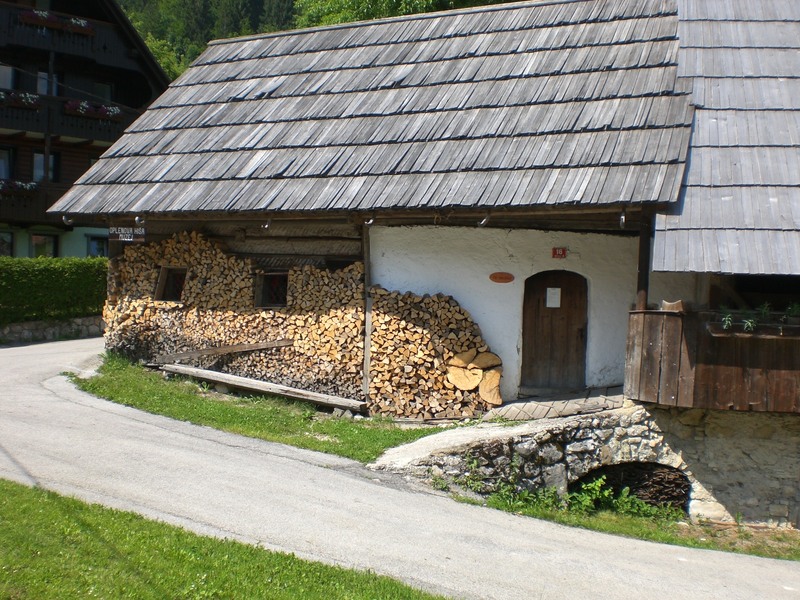 The Draga Inn (Gostišče Draga) is situated at the end of the valley alongside the Begunščica stream, making it an oasis of calm and tranquillity. During the summer months its position affords welcome relief from the heat, thanks to the freshness of the stream, whilst in the winter the Inn is toasty warm thanks to the log-burning fire – just perfect for me! 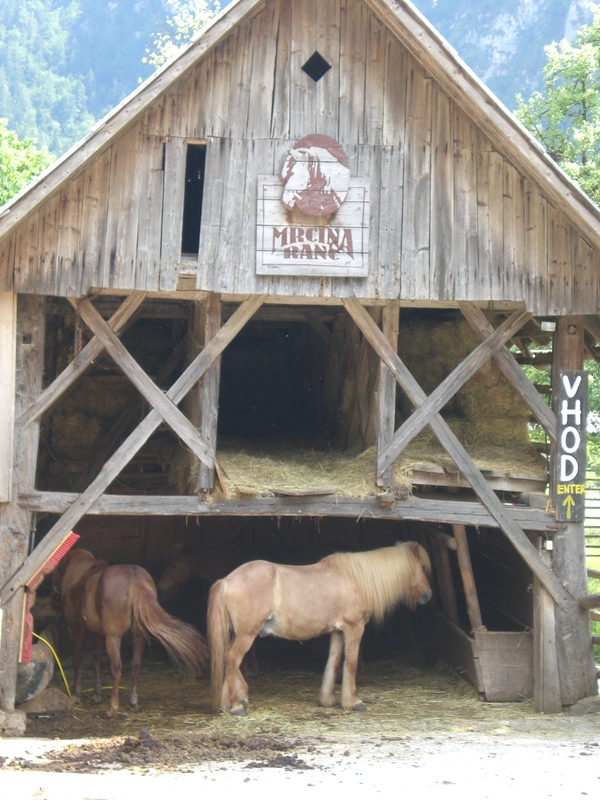 The Inn is particularly popular with weary hikers looking for some sustenance after a long hike. 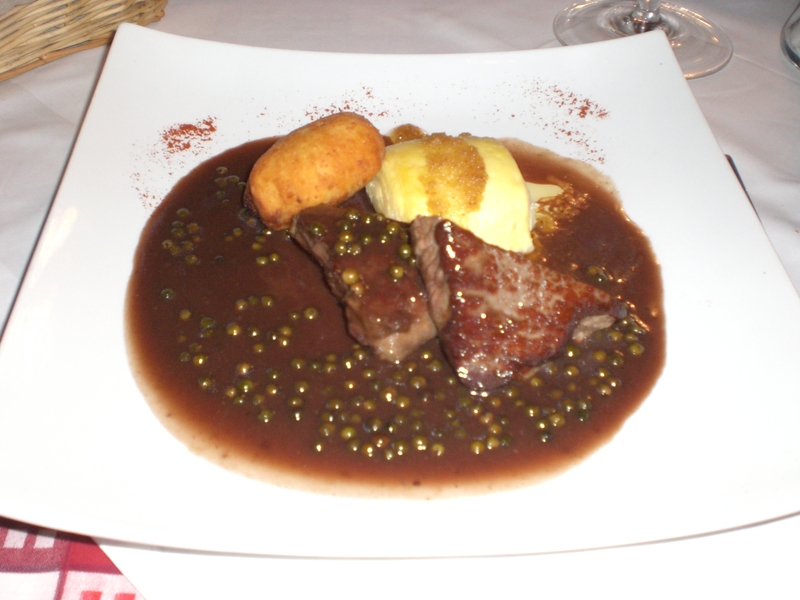 However, it also offers a more gourmet experience for those looking for something finer. 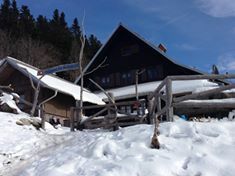 One of the most popular destinations to visit from the Draga valley is the Roblek mountain hut. From the valley it takes around 2 hours to reach the hut at 1672m and since it was dark when I went for dinner, and since the valley was shrouded in pesky low cloud most of the weekend and I just knew that the sun had to be up there somewhere, I returned over the weekend to take some photos and to hike up to Roblek in search of the sun. 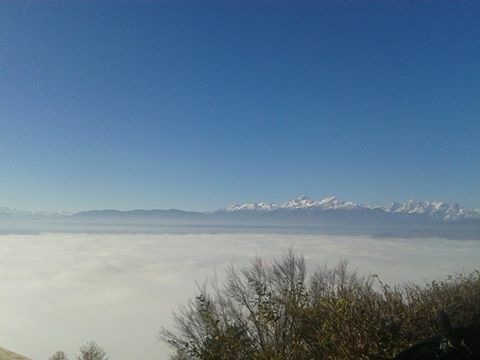 I didn’t have to go for as it was sunny up above 800metres, so I was rewarded for my efforts with fantastic views and warm sunshine up above the clouds. Other than the final 10 minutes, most of the path was free of snow but, as you can see from the picture below, winter has already arrived in the mountains. You can visit the valley by car, by bike or on foot, and a great way to reach the Draga Inn is via the Lamberg Trail which officially begins at the car park opposite the Avsenik Restaurant and Museum in Begunje. 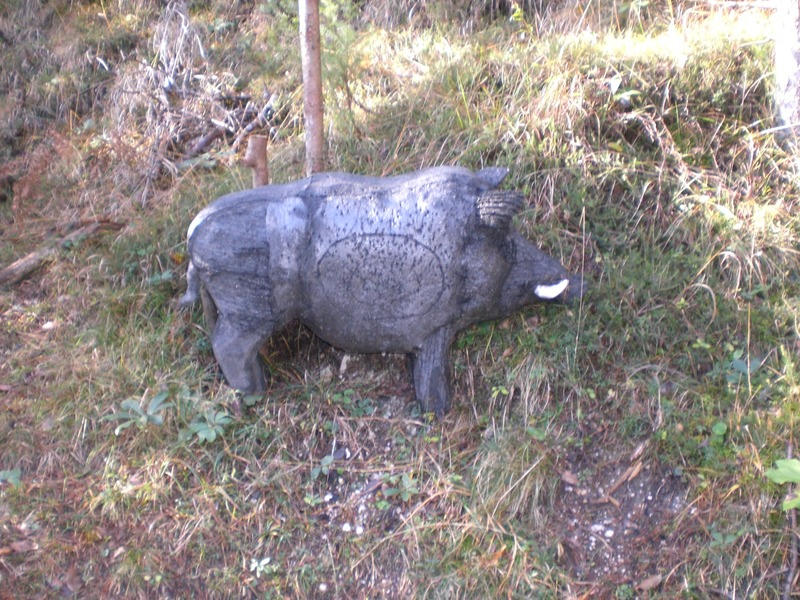 However, you can also park, as I usually do, at the Krpin Recreation Ground in Begunje and begin the walk from there. 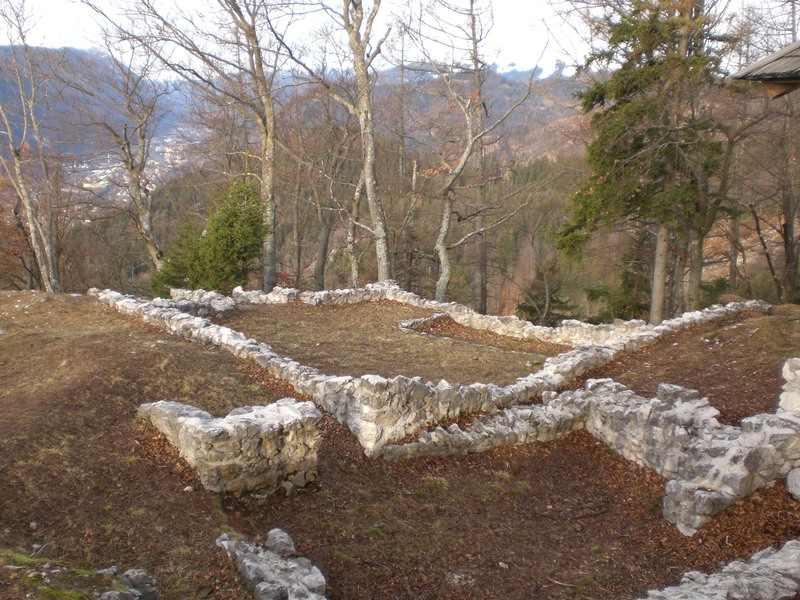 The trail runs behind the ruins of Kamen Castle and ends at the Inn, passing several information boards and sights of interest. 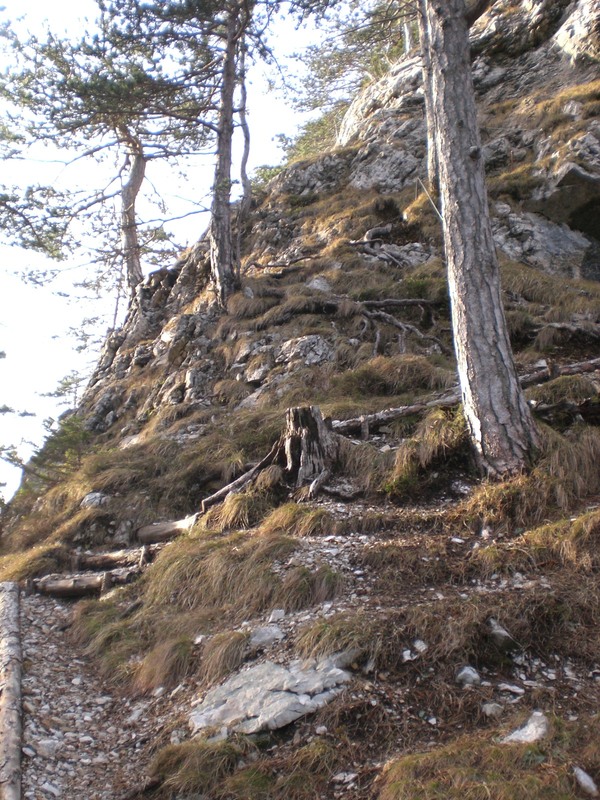 The path is a little undulating but not difficult and takes about 45-1 hour minutes each way. 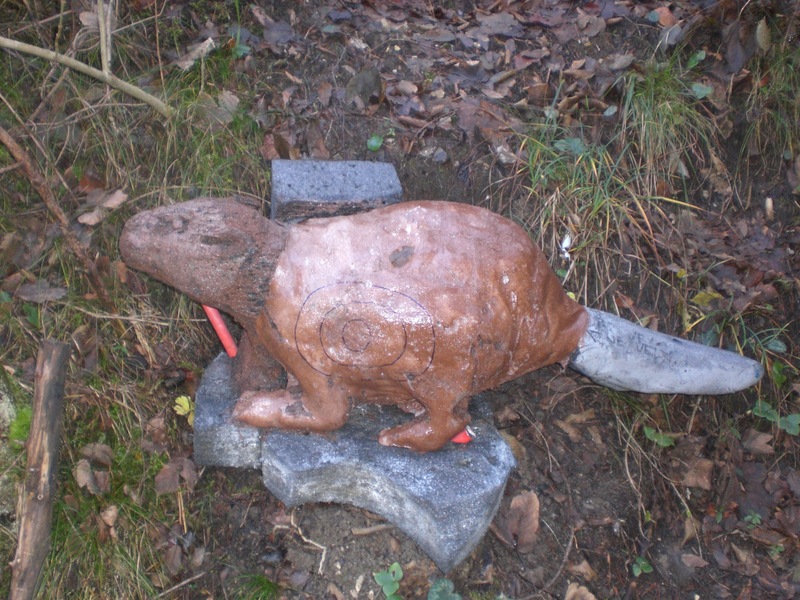 More about the trail can be found here – http://www.radolca.si/en/lamberg-trail-begunje/ Keep your eyes pealed for wildlife though, who knows what you might encounter! As it is still November, and therefore the month of Taste Radol’ca, my friend and I decided we just had to take the chance to sample the Taste Radol’ca menu, and in fact because Gostišče Draga are offering 2 Taste Radol’ca menus, we plumped for one of each so we could try each others too (don’t we all do that?). However, since I don’t eat fish and menu 2 is predominantly fished-based, I lost out a bit there! The food was thoughtfully presented, tasty, and with generous, but not over-the-top, portion sizes, which was just as well as there were 4-courses to try. 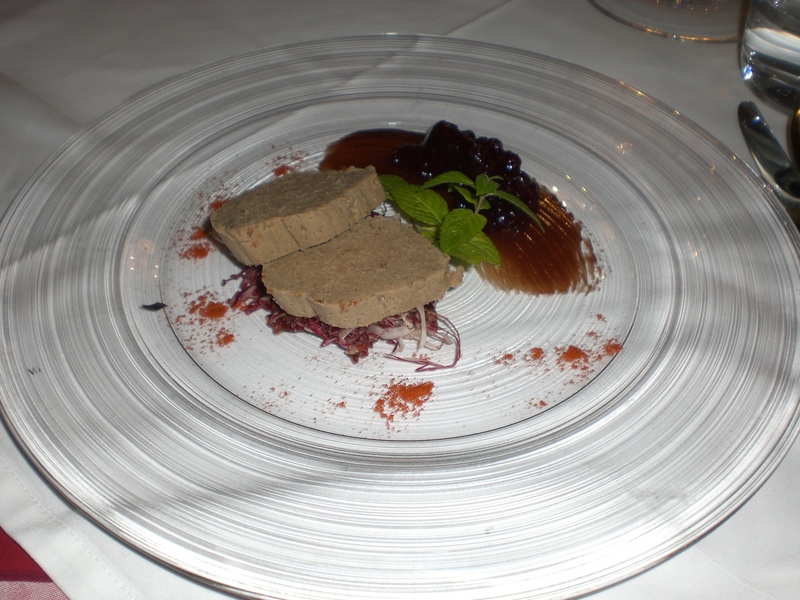 We began with game pate with cranberries (menu 1) and smoked trout (menu 2). 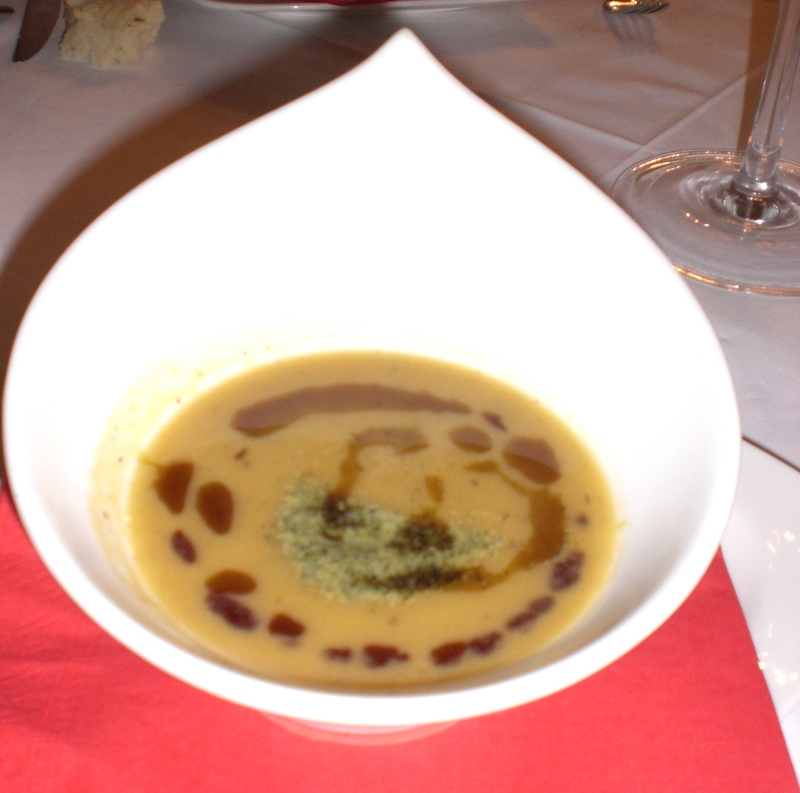 This was followed by pumpkin soup with toasted pumpkin seeds. Next came fillet of deer (in my case substituted for beef) in a honeyed-pepper sauce, cheese strukelj and, one of my favourite things on their menu, house dumplings filled with cranberry sauce. 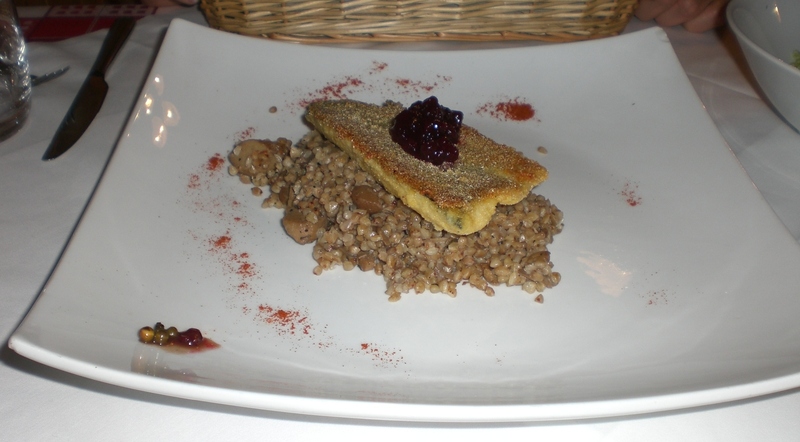 Menu 2 was trout fillet in cornmeal with buckwheat and mushrooms. Dessert was apple strudel (menu 1) and hot-chocolate soufflé (menu 2). 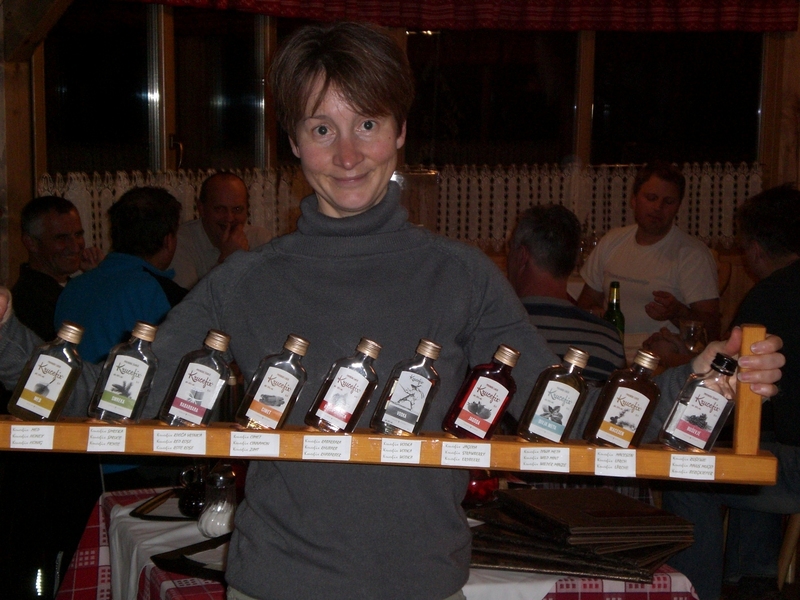 Oh, and of course all capped off with a little glug of one of the myriad flavours of schnapps on offer! So, I have now completed the (arduous!) task of reviewing this year’s new additions to Taste Radol’ca and am no doubt a few kilogrammes heavier for having done so! More information about all the participating restaurants can also be found under the Taste Radol’ca heading at the top of the blog. With the festive season rapidly approaching, this week Radovljica’s residents are invited to help decorate the old town to help make it into a festive winter wonderland. Decoration, and the making of decorations, will take place on Wednesday (9am – 1pm), Thursday (9am – 1pm and 3pm – 7pm) and Friday (3pm – 7pm) in the atrium of the Radovljica Mansion. Come and join us and get in the festive spirit!